Sorry to pester you with an emailing so soon after the Weekly Update, but here are a couple of Breaking News kinda things. This is very important and time sensitive, and yet we have forgotten to include it in the last two Weekly Updates. Sorry, we’re just too busy and juggling too many things. Wayne has posted a list of all our Megaverse Insider crowdfunding backers for Rifts® Northern Gun One. Everyone who participated in that crowdfunding gets their name printed on a special thank you credits page. The last time we did this, we spelled a dozen names wrong and we do NOT want that to happen again. Please check the list and make sure your name is spelled properly. If it is spelled wrong or incomplete, contact Palladium immediately so it is printed correctly in the book. If it is correct, nothing more needs to be done. You are set to go. DEADLINE: Tuesday, August 6, 2013. Click here to see the list of names by category. Robotech® The Macross® Saga Sourcebook – Available now! 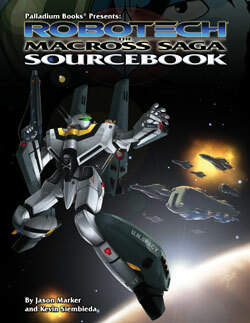 BACK IN PRINT: Robotech® Macross® Saga Sourcebook. This sourcebook contains some of the most iconic mecha and famous action of Robotech® starting here with the Macross Saga – the First Robotech War. This is also the setting for Robotech® RPG Tactics™, so if you’re looking for more information about the mecha, Earth’s defenders, the Zentraedi invaders, and Macross Saga setting, this is the book for you. Epic adventure awaits. Have a great weekend and game on!